HOUSTON – Grab your drumsticks, tuners and your trusty Giita and discover how the band got together in Sentai Filmworks’ latest acquisition, K-ON! Season 1. From original creator Kakifly,this musical slice of life comedy is directed by Naoko Yamada (Tamako Market, CLANNAD: After Story) with chief animation direction by Yukiko Horiguchi (Lucky Star, The Disappearance of Haruhi Suzumiya), sound direction by Yota Tsuruoka (Beyond the Boundary, The Big O), and animation production by Kyoto Animation (Love, Chunibyo & Other Delusions!, Tamako Love Story). Being late on the first day is exactly what you’d expect from Yui Hirasawa in her freshman year at Sakuragoaka Girl’s High School. The number of clubs fighting over her to join up is decidedly unexpected, and Yui has no clue which club to join: she’s not very athletic and knows next to nothing about the liberal arts, but she’s determined to do SOMETHING this year. As luck would have it she discovers a flyer for the Light Music Club, and what she thinks will be a carefree ride down easy street suddenly gets turned up to 11 when she finds out that in order to join, she needs to actually learn to play an instrument! With the energetic drummer Ritsu, extra shy bassist Mio, and piano prodigy Tsumugi, it’ll be easy to bring her skills up to speed before the Light Music Club gets the axe, but it may take a few licks to get these four new friends in sync and ready to rock! 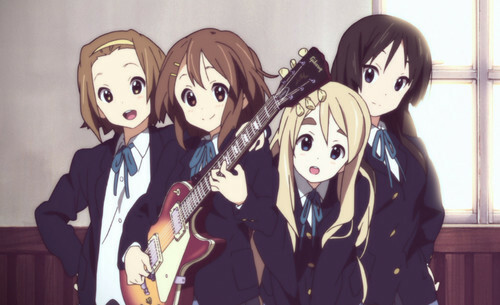 In this club the cakes, teas and high keys will make or break the band as Yui and her new friends play to their own beat in K-ON! SEASON 1! K-ON! Season 1 will be available soon through select digital outlets with a home video release to follow. kyoto animation naoko yamada k-on!